Step Sisters is a 2018 dance comedy film directed by Charles Stone III. It stars Megalyn Echikunwoke as a black sorority girl who agrees to teach the art of Greek stepping to a house of party-obsessed white sorority sisters. Jamilah is an ambitious college student. She’s president of her black sorority, captain of the highly regarded step team, a trusted liaison to the college dean, and has plans to attend Harvard Law School. But after her school's reputation is tarnished by a band of hard-partying white sorority girls, Jamilah is forcibly enlisted to help set things right. She's tasked with not only teaching these girls how to step, but also helping them to win a competitive dance competition. The film's main roles were cast in May 2016. The film was scheduled to be released in March 31, 2017 by Broad Green Pictures. However, it was ultimately pulled from the schedule. Shortly after, Netflix acquired distribution rights to the film, following Broad Green dropping the film, and it was released by Netflix on January 19, 2018. On Rotten Tomatoes the film has an approval rating of 22% on 9 reviews. ^ "Netflix Original Step Sisters". Netflix. Retrieved January 20, 2018. ^ "'Bad Santa 2' Bombs: Broad Green's Shift to Mass-Appeal Fare Sees Early Signs of Trouble". The Hollywood Reporter. December 7, 2016. Retrieved March 9, 2017. ^ McNary, Dave (May 26, 2016). "'Step Sisters' Cast Unveiled by Broad Green". Variety. ^ Gettell, Oliver (May 26, 2016). "Drumline director sets sorority comedy with 90210, The Middle stars". Entertainment Weekly. ^ a b Siegel, Tatiana (May 26, 2016). "Broad Green Casts Its Ensemble for Dance-Themed Comedy 'Step Sisters'". The Hollywood Reporter. Retrieved January 23, 2018. ^ D'Alessandro, Anthony (December 16, 2016). "'Step Sisters' Steps Into The Spring For Broad Green". Deadline Hollywood. Retrieved December 16, 2016. ^ "Step Sisters". ComingSoon.net. Retrieved February 3, 2017. ^ Thompson, Anne; Winfrey, Graham (February 16, 2017). "Broad Green Pictures Is Missing Release Dates and Angering Filmmakers. Here's Why". Indiewire.com. Retrieved March 10, 2017. ^ Hipes, Patrick (November 9, 2017). "Netflix Steps In To Land Sorority Comedy 'Step Sisters'". Deadline Hollywood. Retrieved November 9, 2017. ^ Netflix US [@netflix] (January 2, 2018). 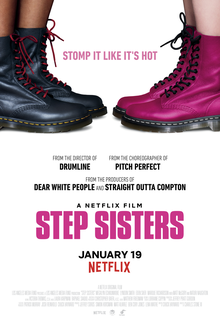 "@StepSisters, a Netflix film from Drumline director Charles Stone III, arrives January 19" (Tweet). Retrieved January 20, 2018 – via Twitter. ^ "Step Sisters (2018)" – via www.rottentomatoes.com.